Sushi Kim has been one of my family's favorite sushi restaurants in Pittsburgh for years. The establishment is an odd location for happy hour as there is no actual bar, only a sushi bar. I think the staff was a little confused when we gradually took over the entire sushi bar and kept demanding more sake and coors lights rather than ordering food. After everyone finished their food, I ordered my beef bulgogi, pictured above. Bulgogi is marinated Korean style barbeque. 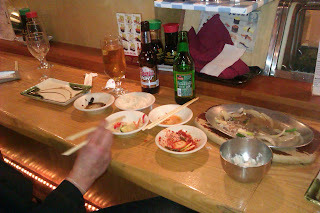 The Korean barbeque selections are what make Sushi Kim special, it is not particularly common to find a sushi restaurant carrying a large selection of authentic Korean dishes. 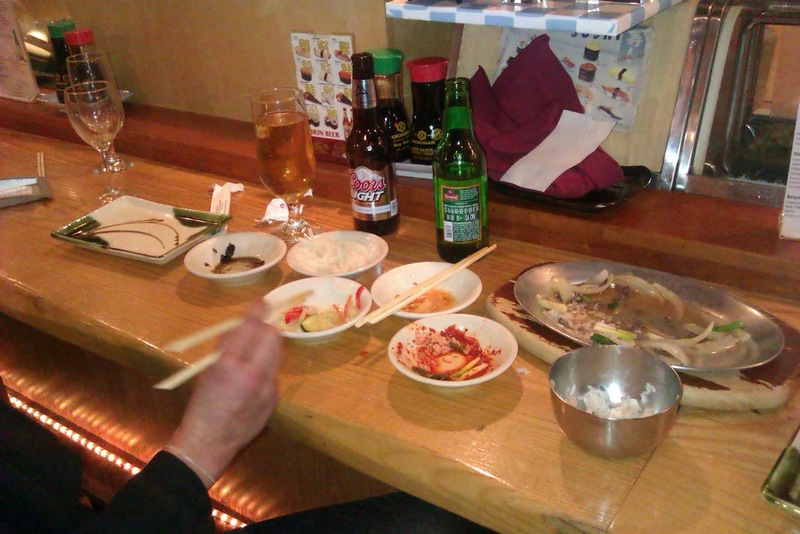 The bulgogi was excellent, you can tell by how little was left by the time I took the picture. One thing I love about Korean barbeque is all of the side dishes. In addition to your main dish you can expect small bowls of broccoli, daikon radish, kim chi, black beans and other assorted goodies. Due to the atmosphere and limited drink selection I can't recommend Sushi Kim for happy hour, but I highly recommend stopping by for the eats.